The diversity in today’s herps means a great difference in their feeding habits. Most amphibians are carnivorous while reptiles can be flesh eaters, plant eaters or omnivorous (eating both plant and animal foods) depending on their species. No matter what form their nutrition takes, however, the most decisive factor is its components. The basic necessities in nutrients have been taken into account when formulating NEKTON-REP. The large proportion of vitamin A (retinol) it contains is extremely important for forming the skin and mucous membranes of reptiles and amphibians. An adequate supply of calcium is also important, especially to insect-eaters as this element is usually missing in the chitin cuticle or skeleton. NEKTON-REP therefore contains a high percentage of calcium together with vitamin D3 to aid the adsorption of calcium by the animal's body. But it is the harmony and balance of the formula that make it one of the most beneficial supplements for reptiles and amphibians. Each vital substance is dosed and blended to complement and promote the other thus strengthening the entire organism. Aids healthy bone growth. Promotes smooth skin sloughing. Helps formation of healthy skin and mucous membranes. 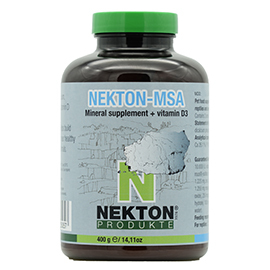 The same formula of important vitamins such as vitamin A and D3, essential amino acids and vital mineral elements for good health and condition plus the carotenoids Canthaxanthin and Apocarotinal. 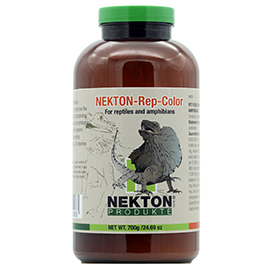 NEKTON-REP-COLOR is also in a position to prevent many deficiencies and thus help avoid health disorders. Canthaxanthin and Apocarotinal (apo-8-carotenoic acid ethyl ester) are carotenoids, an important group of natural reddish/yellow pigments widely distributed in plants, as in tomatoes, carrots or oranges. Many carotenoids are precursors of vitamin A, that is, they develop certain vitamin A qualities in the body. This means they have a beneficial physiological value as well as enhancing colours or reviving pale and faded colours to their former beauty. The carotenoids in NEKTON-REP-COLOR have been produced synthetically but are nevertheless identical to those the animals would find in their diet in the wild and therefore safe. Contains health-giving and life-maintaining ingredients. 13 Vitamins (in particular The B group of vitamins), 18 Amino Acids, Calcium & Phosphorus, Trace Elements. 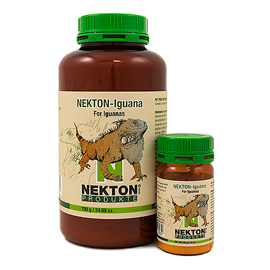 All the ingredients in NEKTON-Iguana are in such a form that they are immediately and easily absorbed in full by the animal's organism. It supplements the daily diet with Carbohydrates, Fatty Acids, Proteins, Vitamins, Macro and Micro Elements. Vitamins and minerals (macro and trace elements) are essential for the chemical activities of the body. Reptiles, like other animals, cannot produce their own vitamins or not in sufficient quantities and must obtain them "ready-made." If a diet is deficient in one or more vitamins this results in a breakdown of normal bodily activities and produces some symptoms of disease. An avitaminosis (vitamin deficiency) leads to the iguana's fresh green colour turning dull grey-green and can cause the points of the crest to die off. Together with a malfunctioning protein synthesis it can also lead to gout, a common occurrence in reptiles. A deficiency in any of the B group of vitamins is particularly serious as it can often result in paralysis, convulsions, impaired growth and skin problems, in particular the skin sloughing process. Furthermore a wide variety of mineral substances are required by the body for the construction of certain tissues. Although the body is able to store some of these mineral elements, certain amounts are constantly excreted unchanged and must be replaced daily to ensure adequate reserves in times of increased metabolic activity. Of the macro elements calcium and phosphorus in particular are needed for the bones. 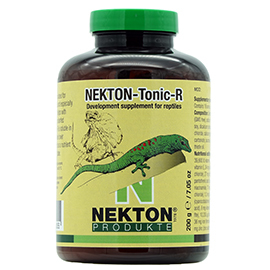 NEKTON-Iguana, therefore, contains a balance of calcium and phosphate together with vitamin D3 to aid the adsorption of calcium by the animal's body. 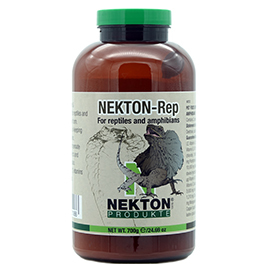 This makes NEKTON-Iguana particularly valuable during such periods of stress as illness, skin sloughing, re-housing and acclimation, and has proved an excellent support during transport. CARBOHYDRATES to give the basal metabolism added energy and boost activity. PROTEINS made out of the same vegetable matter the reptile's organism is used to in its natural surroundings. In addition, 18 pure amino acids have been added to increase the nutritive value of the tonic impressively. ESSENTIAL FATTY ACIDS to help prevent illnesses due to deficiencies. VITAMINS AND PROVITAMINS, which are vital organic substances that must be present in a reptile's diet if serious and irremediable illnesses are to be avoided. MINERAL ELEMENTS Any tonic has to have a high content of macro and trace elements if it is to have a far-reaching effect. However, the value of this first-class tonic does not lie alone in the presence of all these essential components, but above all in their balance. A special calcium supplement plus other macro and vital trace elements and boosted by vitamin D3 to help rear young animals and treat calcium deficiencies. Mineral elements are extremely important for maintaining good health, top stamina and uninterrupted propagation. Minerals and trace elements are essential, in fact, vital substances for an animal's metabolism. As they are repeatedly secreted unchanged by the body, they must be replenished constantly by means of the diet. Promotes bone and teeth growth. Maintains every metabolic process. Contains all the important mineral elements. 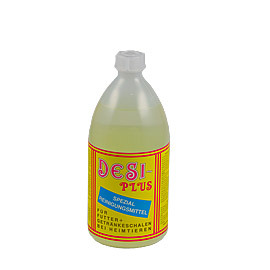 Disinfectant for pet utensils and toys. Retains its full effect at low temperatures. Helps protect against gastroenteritis and thrush, prevent infectious diseases from spreading, guard against fungus infections and keep pets healthy. Ensures germ-free utensils without boiling.